At one time or the other when building our Node application we have been faced with uploading a photo (usually from a form) to be used as a profile photo for a user in our app. In addition, we usually have to uniquely store the photo maybe in the local filesystem (during development) or even in the cloud (AWS, Cloudinary) for easy access. Since this is a very common task, there are lots of tools available which we can leverage on to handle the individual parts of the process. In this tutorial, we will see how to upload a photo and manipulate it (resize, crop, greyscale, etc) before writing it to storage. We will limit ourselves to storing files in the local filesystem for simplicity. We will be using the following packages to build our application. express - A very popular Node server. multer - A package for extracting files from multipart/form-data requests. jimp - An image manipulation package. dotenv - A package for adding .env variables to process.env. mkdirp - A package for creating nested directory structure. concat-stream - A package for creating a writable stream that concatenates all the data from a stream and calls a callback with the result. streamifier - A package to convert a Buffer/String into a readable stream. We want to take over the uploaded file stream from Multer and then manipulate the stream buffer (image) however we wish to using Jimp, before writing the image to storage (local filesystem). This will require us to create a custom storage engine to use with Multer - which we will be doing in this tutorial. Here is the end result of what we will be building in this tutorial. Once you have the Express generator, you can now run the following command to create a new Express app (photo-uploader-app in my case) and installing the dependencies for Express. We will be using ejs as our view engine. Next, we will go ahead and install the remaining dependencies we need for our project. Before we continue, our app will need some form configuration. We will create a .env file on our project root directory and add some environment variables. The .env file should look like the following snippet. Next, we will load our environment variables into process.env using dotenv so that we can access them in our app. To do this, we will add the following line to the app.js file. Ensure you add this line at the point where you are loading the dependencies. It must come before all route imports and before creating the Express app instance. Let&apos;s begin by creating the basic markup for our photo upload form by modifying the views/index.ejs file. For the sake of simplicity we will add the styles directly on our view just to give it a slightly nice look. See the following code for the markup of our page. Notice how we have used our local variables on our view to set the title and the name of the avatar input field. You will notice that we are using enctype="multipart/form-data" on our form since we will be uploading a file. You will also see that we have set the form to make a POST request to the /upload route (we will implement later) on submission. Now let&apos;s start the app for the first time using npm start. So far, trying to upload a photo through our form will result in an error because we&apos;ve not created the handler for the upload request. We are going to implement the /upload route to actually handle the upload and we will be using the Multer package for that. If you are not already familiar with the Multer package you can check the Multer package on Github. You can also read this article for a quick start. Let&apos;s begin to add the implementations for the listed functions in our storage engine. We will begin with the constructor function. Here, we defined our constructor function to accept a couple of options. We also added some default (fallback) values for these options in case they are not provided or they are invalid. You can tweak this to contain more options depending on what you want, but for this tutorial we will stick with the following options for our storage engine. storage - The storage filesystem. Only allowed value is &apos;local&apos; for local filesystem. Defaults to &apos;local&apos;. You can implement other storage filesystems (like Amazon S3) if you wish. output - The image output format. Can be &apos;jpg&apos; or &apos;png&apos;. Defaults to &apos;png&apos;. greyscale - If set to true, the output image will be greyscale. Defaults to false. quality - A number between 0 - 100 that determines the quality of the output image. Defaults to 70.
square - If set to true, the image will be cropped to a square. Defaults to false. threshold - A number that restricts the smallest dimension (in px) of the output image. The default value is 500. If the smallest dimension of the image exceeds this number, the image is resized so that the smallest dimension is equal to the threshold. responsive - If set to true, three output images of different sizes (lg, md and sm) will be created and stored in their respective folders. Defaults to false. Let&apos;s go ahead and implement the methods for creating the random filenames and the output stream for writing to the files. Here, we use crypto to create a random md5 hash to use as filename and appended the output from the options as the file extension. We also defined our helper method to create writable stream from the given filepath and then return the stream. Notice that a callback function is required, since we are using it on the stream event handlers. Generates a random filename, resolves the Jimp output image mime type and gets the image dimensions. Resize the image if required, based on the threshold requirements to ensure that the smallest dimension does not exceed the threshold. Crop the image to a square if enabled in the options. Convert the image to greyscale if enabled in the options. Set the image output quality from the options. If responsive is enabled, the image is cloned and scaled for each of the responsive sizes (lg, md and sm) and then an output stream is created using the _createOutputStream() method for each image file of the respective sizes. The filename for each size takes the format [random_filename_hash]_[size].[output_extension]. Then the image clone and the stream are put in a batch for processing. If responsive is disabled, then only the current image and an output stream for it is put in a batch for processing. Finally, each item in the batch is processed by converting the Jimp image buffer into a readable stream using streamifier and then piping the readable stream to the output stream. Now we will implement the remaining methods and we will be done with our storage engine. Our storage engine is now ready for use with Multer. * and setup Multer for use with the /upload route. Here, we are enabling square cropping, responsive images and setting the threshold for our storage engine. We also add limits to our Multer configuration to ensure that the maximum file size is 1 MB and to ensure that non-image files are not uploaded. Notice how we passed the Multer upload middleware before our route handler. The single() method allows us to upload only one file that will be stored in req.file. It takes as first parameter, the name of the file input field which we access from process.env.AVATAR_FIELD. Now let&apos;s start the app again using npm start. You can tweak the configuration options of the storage engine in our Multer setup to get different results. 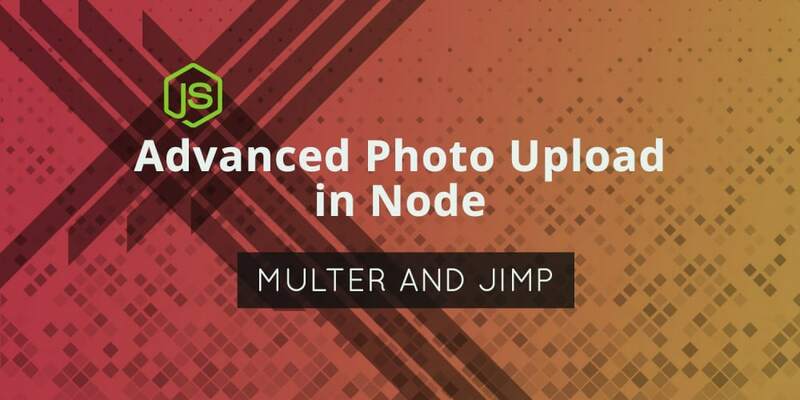 In this tutorial, we have been able to create a custom storage engine for use with Multer which manipulates uploaded images using Jimp and then writes them to storage. For a complete code sample of this tutorial, checkout the advanced-multer-node-sourcecode repository on Github.